“They’re poor down there but they’re the happiest people in the world,” that passing acquaintance in Dallas said of Belizeans. Here a 14 y.o. 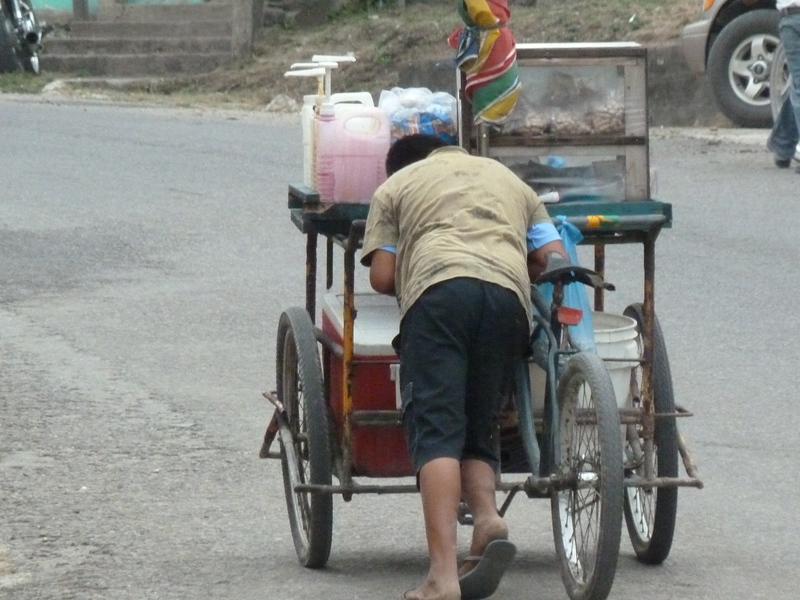 Belizean boy, whose family couldn’t afford his schooling anymore, pushes his vendor cart uphill to level ground where he can pedal it on level ground a while. But he’ll push up a rocky road to get it home before dark. This is the fifth in a seven-day series of “Noon Wine” reflections on the poor and poverty. Lest I give too distorted a view, many Belizean people, as in any country, prosper with their businesses or professions. My landlord, for example, is in the construction business, among other businesses, and building his dream home with plans for the solar panels that are becoming hot sellers in ecology-conscious Belize these days. A neighbor lived in the U.S. for seven years where he was in mid-level management at Goldman Sachs in Miami and seldom missed a Miami Heat home game. 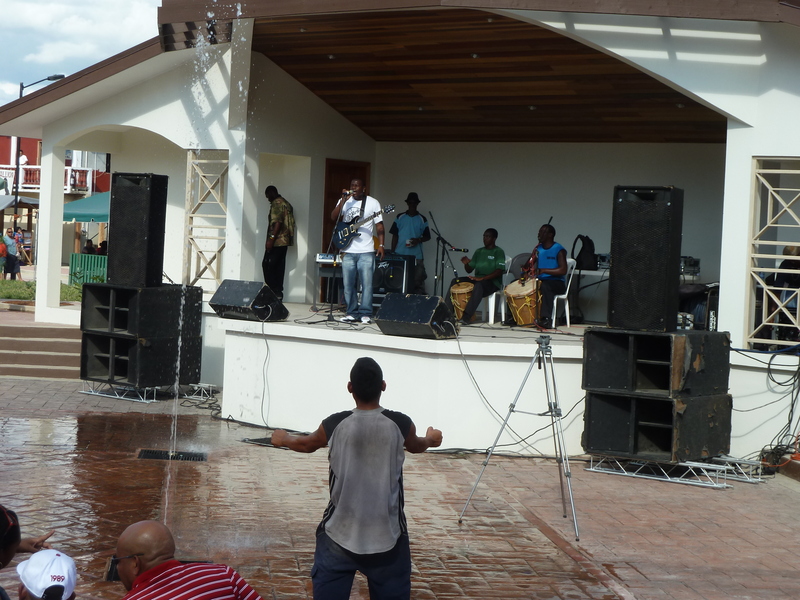 But so many seemingly happy and gusto-filled Belizeans live with daily, uphill struggles in a country where unemployment has been stuck for 10 years at 50 percent. When you hear their stories you may realize you sometimes look at the poor and struggling people with eyes wide shut. For Luz Garza, June 24, 1970 – June 26, 2013, R.I.P. in perfect rest, perfect peace, good man. When I was a chaplain at Baylor Medical Center in the Dallas suburb of Garland, I knew and worked with a wonderful young physician, Dr. Scott Wang. Wang acknowledged his surprise at experiencing the raw emotions of people who live at society’s margins. Many of us in the largely prosperous West like to believe that many, maybe even most, of the poor are plenty happy and content with their lot in life. Last year, when I told a passing acquaintance of mine in Dallas that I was moving to Belize, he noted that he and his wife are scuba divers and vacation at least once a year in Belize for the great diving in Belize’s famous Blue Reef. He said that one summer they vacationed an extra week, rented a vehicle and drove aimlessly all over Belize for all the inland beauty and adventure it offers. I can’t deny that there’s some truth in his assessment of happiness in Belize. If you come to see me here in the country promoted as “the Caribbean Jewel,” you’ll see a lot of gusto-filled Belizeans laughing and smiling or chilling out like they don’t have a care or worry in the world. But you’re invited to ride with me some night from 7 to 10 on the overcrowded, cheap and bumpy “chicken buses”–or crammed into a pre-historic Toyota taxi. Notice the utter exhaustion in the faces and the slumping body language of most of those riders. Talk to those friendly Belizean riders (but don’t wake those sleeping while sitting straight up over every jolting bump and constant stop-and-go motion) and ask them how far they have yet to walk to get to their homes and families when the bus or taxi drops them off at some dark and rocky road. And by the way–they might be getting off the bus or out of the cab in a drenching, rainy season downpour. with their umbrella, a purse or bag, and undoubtedly with groceries or something else to tote on these steep-hill roads. Ask some friendly rider what time he or she will have to roll out of bed to tend to feeble or disabled parents or grandparents or great-grands while getting the kids off with enough money for their bus and cab fares to get to school in their mandatory washed-and-cleaned school uniforms that require so much constant washing and drying. And oh yeah–the school kids have to eat, and there’s precious little that is free of charge for a Belizean student. Get up and out and about with me at 5 the next morning–rain or shine–and you’ll see Belizeans already boarding those rattle-trap taxis and chicken buses looking fresh and radiant and smiling those warm and radiant Belizean smiles. But when it turns dark tonight–and it’s dark at 6:30 every night–come walk a local neighborhood in San Ignacio/Santa Elena with me–or better yet in one of the multitudes of Belizean villages–and you’ll see a lot of people looking like life just whipped them down today. Because it did. And if it didn’t whip them today, you can bet your vacation money that another life whipping will come around all too soon. That passing acquaintance, whom I mentioned above, managed in his tour of Belize to see a lot happy and smiling faces. But like so many prosperous people of the world, he was looking at Belize’s people through the tunnel vision of his own prosperity. I doubt he’d want to trade his happiness with that of “the happiest people in the world” if he looked and looked closer at them through the eyes with which Christ sees them. * Here’s the link to the Baptist Standard story about Dr. Wang and featuring quotes from my other friends Dr. Steven Arze and my former boss in chaplaincy at Baylor the Rev. Mark Grace. I am simply mesmerized by your writing. Please continue to write and post these stories. I/we need to read and see them. Fascinating story, Paul. The same sentiment was often used by us “farong” (foreigners) in describing the Thai people. The motto of Thailand was “the land of smiles” but there was indeed abject poverty; however, hunger was NOT an issue as Thailand is the “breadbasket” of SE Asia. I am trying to figure out whether the two countries are even comparable as my experience there was (1964-1966) so long ago. With that said, Buddhists do seem to be at peace with themselves unlike us westerners and it was and still is primarily a Buddhist country. Things have changed so much now that has brought in Muslims moving up from the Malay Peninsula – many of them radicals that bomb folks and such. On that peninsula that is within the Thai border is a beach that was THE place when I was there but now is totally run by the Russian Mafia which has increased drug-trafficking and prostitution. Pattaya (the beach resort) is obviously not the same as the profits go to the mob rather than the Thai people thus Phuket (pronounced foo-kay) is now the beach of choice among westerners (primarily from Europe). I could babble on forever but. . . .
Well I’ll probably hit on the drugs and mind-blowing violence, especially in near no-man’s land that south Belize City can be, and prostitution and social ills next time. Drugs & prostitution have powerful appeal everywhere there’s poverty and multiplies the social problems a thousand fold. Thanks for some education/perspective on Thai, bud. Thanks for the gracious reply, Paul. Take care of yourself – PLEASE!!!!! post. I will be coming again to your weblog for more soon. Thanks, glad it grabbed you.